Robertvs Dvglass. S.R.M. 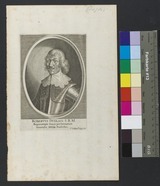 Regnorumque Sueciæ per Germaniam Generalis Militiæ Præfectus / Wolfgang Kilian sculp.